Firstly, there remains a discrepancy between the name that this product has been given and the method of usage that has been stated in the labelling. The product name says that it is a cleanser, and assuming it to be a face wash, I picked it up. I’ve tried Biotique products before and some of them are amazing while some don’t seem to work for me. My favourite has always been the Biotique Myristica Face pack; I’ve restocked it so many times by now. 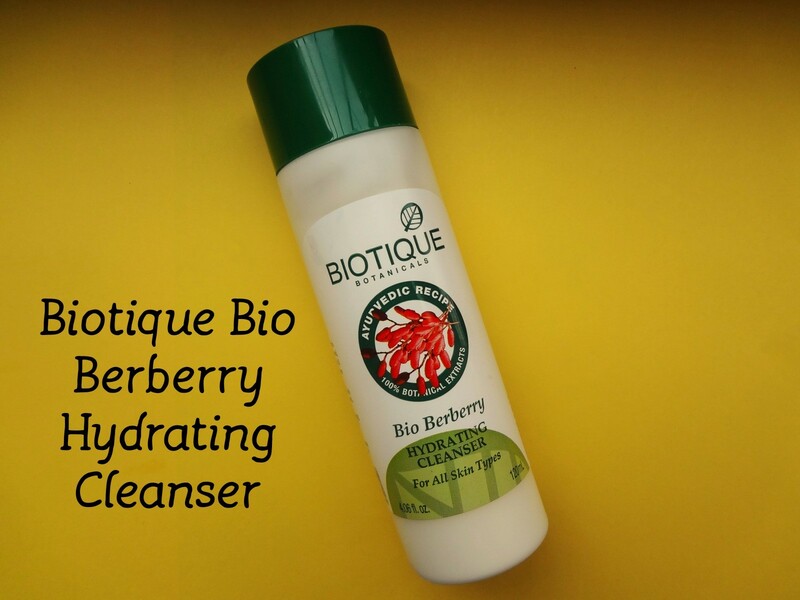 Biotique Berry Hydrating Cleanser comes in a cylindrical screw cap packaging. The labelling isn’t quite appealing but that goes for all Biotique products. The cylindrical bottle is white, while the cap is dark green in color. It retails at INR 170 for net content of 120 ml. It claims to cater for all skin types. As I mentioned earlier, assuming it to be a face wash, I went ahead for washing my face. When used it as a cleanser first, this product failed terribly in getting rid of any dirt or greasiness. This made me read the directions on the product. After reading instructions, I realized that it ought to be used post washing the face using a cotton ball. This ironical naming was quite disappointing. If I would have wanted a face moisturizer, than I would have looked for a labelling that reads- moisturizer. As a moisturizer this product works well. It gives slight moisturization without greasiness. There is a slight lemon- citrusy fragrance in this “cleanser”. One thing that I’ve usually encountered on application of this product is slight itchiness on my face and minute bumps emerging, but that is perhaps because post acne attack, my skin has turned extra sensitive and it reacts this way with a lot of cream based products. So, sensitive skin people should complete ditch on this. I’d say, buy it if you are looking for an everyday face moisturizer. Yet, it might not provide adequate moisturization to dry skin ladies. For normal to oily skin, it would work decently.